Una modificación final del T-34 de 1943. Una nueva torreta para un cañón de tres personas permitió montar un cañón más potente de 85 mm. Esto mejoró la efectividad en combate del carro en comparación con su predecesor, el T-34-76. Se fabricaron un total de más de 35 000 en varias variantes. Hoy el carro todavía sigue en activo en varios países. The T-34-85 retains the same hull as its predecessor, the T-34, but receives a new, more heavily armored turret with more powerful choices of armament. Stock, it is quite sluggish and armed with the under-par 76 mm S-54, but later on it receives a somewhat more powerful engine and the excellent 85 mm D5T-85BM, turning it into a versatile and capable Tier 6 medium tank. Well-rounded stats in the 85 mm D5T-85BM with good aim time, alpha damage, penetration, and accuracy. Good top speed and maneuverability. Fairly well-armored and well-rounded turret front. Outstanding versatility means many roles can be executed with ease. Alpha damage is excellent compared to the German L/70 or British QF 75mm HV. Weak hull armor for its tier. Poor gun depression, which limits hull-down opportunities. Terrain resistance is rather high for medium and hard surfaces. The T-34-85 is a fairly well-rounded and versatile medium tank, capable of adapting to most situations on the battlefield. In terms of mobility, the T-34-85 is good enough to perform its job adequately, but it is outclassed by the M4A3E8 Sherman and Cromwell. The turret armor is good by Tier 6 standards, but the hull armor is very weak (only 45 mm thick, though it is well-sloped). Going hull-down is a good idea in the T-34-85, since the turret armor is quite good and capable of bouncing a lot of shots. Be mindful of the turret ring, however; the shape of the turret and hull unfortunately create a shot trap in this area. 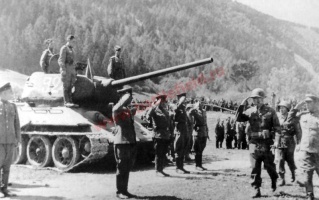 To start with, the T-34-85 receives the 76 mm S-54 which was previously available on the T-34. Unfortunately, it is lacking in penetration and damage by Tier 6 standards, and is not very accurate. The 85 mm ZiS-S-53 is a more versatile option, with fairly good penetration, rate-of-fire, and damage, but has slightly worse accuracy than the S-54. The top 85 mm D5T-85BM is a good gun for Tier 6. It is accurate enough, with sufficiently short aim time, to allow the T-34-85 to act as a sniper if needed, though in that respect it is outclassed by the German Tier 6 mediums, the VK 30.02 (M), and VK 30.01 (P) with the 7.5 cm KwK 42 L/70. The damage output is also reasonably good, though not quite as good as the 8.8 cm KwK 36 L/56 on German tanks, or the 76 mm M1A2 on the American medium tanks, which have better alpha damage and reload times respectively. 144 mm of penetration using AP is excellent by Tier 6 medium tank standards, inferior only to the Cromwell's 75 mm Vickers HV (145 mm), the VK 36.01 (H)'s infamous 7.5/5.5 cm KwK 41 Waffe 0725 (165 mm), and the 7.5 cm KwK 42 L/70 (150 mm) available to all the German Tier 6 medium tanks, balanced by the D5T-85BM's higher alpha damage. The T-34-85's biggest strength, like the T-34's, lies in its adaptability. Knowledge of the tank's and its enemies' capabilities is essential to do well in the T-34-85, since it does not have any particular features that it can reliably abuse. The 122 mm U-11 can be researched on the KV-1. The V-2-34M is required to unlock the final V-54 engine, and it provides a slight mobility boost. The T-34-85 extended turret is needed to unlock the 85 mm D5T-85BM, the T-34-85's best gun. They are not needed to unlock anything but are highly recommended to be researched. Both the 85 mm D5T-85BM and V-54K engine are used on the next tank, the Tier 7 T-43, and are in fact its top gun and engine as well. The other Soviet Tier 7 medium tank, the KV-13, also uses the D5T-85BM as its top gun, and it is one of two guns available to the Tier 7 IS heavy tank and Tier 8 T-44 medium at the start of their grinds. Unlocking these modules on the T-34-85 first is highly recommended, order depends on preference. The T-34-85-60 suspension can be saved for last. It does provide a small bonus to the hull traverse speed. If the U-11 has not been researched, it may be skipped entirely unless eliting the T-34-85 is the goal. Early versions of the T-34 demonstrated their top performance during the Kursk / Citadel battle in 1943. Their superiority on the battle ground was reached not due to their technical perfection, as in this respect German tanks were largely comparable and in some instances (Tigers and Panthers), far superior to their Soviet counterparts, but was due to the overwhelming numbers used by the Red Army. The price paid for the victory was high. Around 9000 tanks were lost in combat against 2200 German tanks. 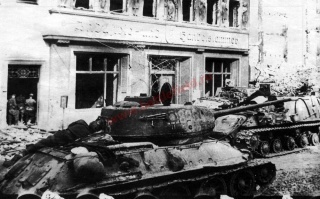 It also became evident that the T-34 could hardly cope with the new examples of German armor, and that is was the time to shift the priority from mass production to major modification of the T-34. 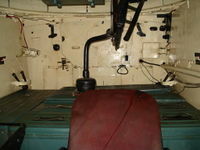 T-34-85 interior. Note the ammo crates on the floor of the tank. 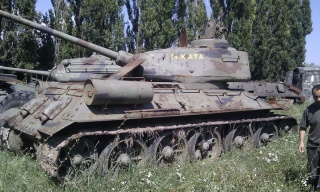 The special commission assigned by the Party investigated and analyzed the nature of the damage to the hundreds and thousands of destroyed tanks. The attempt to add extra armor on the T-34 was made, and the result was named the T-43. 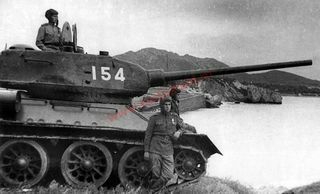 The conducted experiments with the T-43 proved that when dressed in the extra armor, the T-34 lost most of its best features, such as maneuverability and speed, without any real gain in defense against deadly the 8.8 cm gun. The new tank needed not so much the better armor, but the better gun. Simultaneously, independent experiments were conducted with the KV-13 in order to create the so-called universal tank, or, main battle tank. However, the KV-13, while having the same 85 mm gun, was heavier and more complex in production, so the preference was given to the T-34. The KV-13 design was later used to create the IS-2, which finally offered the proper opposition to Tigers. In August 1943, a special meeting of the GKO (State Defense Committee) decided that a more powerful gun should be installed on the T-34. In the end of 1943, after testing and experimenting with guns, turrets, and caliber, it became clear that the 85-mm gun could not be installed in the old turret. The designing of the new one was carried out by the production works No.112 "Red Sormovo" in Gorkij. 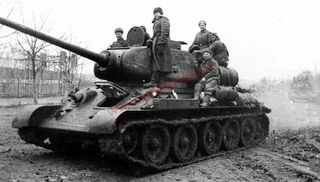 On December, 15,1943, on the basis of three hull prototypes and a turret yet to be finished, the GKO made the decision to start mass production of the T-34-85. At this time, no gun for three independent projects was ready to be installed, as all were to be adapted to the new turret. The work on the improvement of the turret design allowed curing old problems with the turret by increasing its size. At last, the tank commander could command the tank, as one more member was added to the crew. GKO also decided on which gun was to be used (Grabin's). However, the first production T-34-85s had another gun, the (Petrov's D-5T), same as was installed on the SU-85. The hull was practically the same as the T-34 mod. 1943. The gun mask was distinctively different from that of Grabin's ZIS-S-53, which finally went into mass production in January 1944. The changes in the design of the tank did not affect the production. 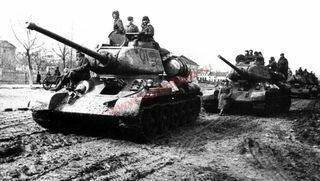 In the spring of 1944, two more plants in Omsk and Nizhnij Tagil joined Plant No.112 in production of T-34-85s. T-34-85 Turret with commander's cupola allowing all-round vision (introduced partway through the production run of the T-34. Model 1943. Most T-34-85s rolled off production lines at the plant in Nizhnij Tagil. All three plants made different turrets. The most distinctive was the so called "composite" turret of the Plant No.112. During production, T-34-85s was continuously modified, although the basic shape was retained. Mass manufacturing of the T-34–85 in the Soviet Union ceased in 1946 (according to some sources, small-scale production continued at the «Krasnoye Sormovo» factory until 1950). As far as the total number of T-34–85 tanks produced at one or another factory, here, just like for the T-34, there exist areas of considerable discrepancy in the numbers cited in various sources. 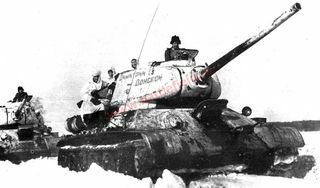 T-34-85s first saw combat in the spring of 1944 with 1st Guard Tank Army and since then, took part in all the battles of the WWII, Korea, Middle East, and Vietnam arenas. The tanks were exported to many countries after the war. In the hands of experienced tankers, T-34-85 was an awesome weapon despite the Tiger's superiority at long ranges, that is, the Tiger could kill a T-34-85 earlier than the 85 mm gun could bore a hole in its skin. Still, the T-34 stood a good chance of success owing to its maneuverability. The Pz.IV of later versions was roughly comparable to the T-34 in firepower, but the T-34-ka had better dynamic characteristics combined with the effective armoring. Still, the threat from German Faustpatrons forced the introduction of some field modifications, especially during the fight in Berlin (see the photo). The additional screening consisted of a thin 1.5 mm, metal plate or a 3 mm wire mesh welded on the supporting corners. The shield was placed in about 15-20 cm from the main armor on the sides of the hull, turret, and the turret's top. Although the screening effectively deflected the hits of Faustpatrons, further development was stopped with the end of the war. The always increasing production and growing skill of Soviet tankers allowed for the neutralizing of German Tigers and Panthers.